This is the second part of Black Litterman Model, check the first part at Black Litterman Model (I). I skip the technical section, which can be found in the original paper Beyond Black-Litterman in Practice: A Five-Step Recipe to Input Views on Non-Normal Markets, and the Matlab codes can be downloaded at http://www.mathworks.com/matlabcentral/fileexchange/9061, in the Extra->COP folder. Suppose we would like to invest in the US treasury market at a weekly investment horizon, and we are interested into the following six key interest rates: 6 month, 2 year, 5 year, 10 year, 20 year and 30 year. For illustration, we use Monte Carlo simulation to generate 100,000 scenarios based on a t Copula with skew t marginal distribution, the sample mean, standard deviation, skewness and kurtosis of the six key rates are shown in table 1. We can easily see from the table 1 that all of the key rates, in particular the short period rates, are non-normally distributed as the kurtosis is significantly larger than 3, which corresponds to normal distribution. 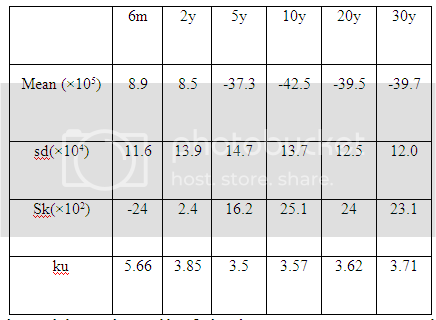 Compared with table 1, we notice the means of 2y and 10y are decreased significantly, and the means of 5y and 20y are increased, which are consistent with our assumed views, since we are bearish on 2y and 10y, and bullish on 5y and 20y. Case 2: Contrary to case 1, we express a 10 bp bullish view on the 2-20 spread and a 5 bp bearish view on the 2-5-10 butterfly, other things being equal. We expect that the means of 2y, 5y, 10y and 20y change another way around. as expected, the means of 2y and 10y are increased significantly, the means of 5y and 20y are increased, and the means of 6m and 30y are again the same as those of prior market. Case 3: The views are the same as for case 1, but we increase the confidence for both view from 25% to 75%. We expect the distribution of posterior market alters more significantly. identical with what we expected, when compared with the results of case 1, the means of 2y and 10y are decreased more significantly, and the means of 5y and 20y are increased more pronounced. For all views, the even moments are only marginally affected. Our robust analysis demonstrates the strong consistence of the COP approach. Based on the posterior market values we are able to do return mapping and portfolio optimization. These two posts are a short summary of the original paper and Matlab implementation, please read the source for detail. I'm a regular reader of your blog, here I just hav a small and simple question but always no idea to prove in analytical way, that is "minimum variance portfolio's beta will be smaller than one"
May I see the original sentence? nychole. The original quesion is "Show that the beta for the minimum variance portfolio is given by β = wl'*Sigma*wm / wm'*Sigma*wm (where sigma is covariance matrix, wl is vector of weight of mv portfolio, wm is that of weight of market portfolio). Proof that the portfolio beta will be smaller than one." Sorry, I don't work it out, please share with me if you get an answer. The problem is solved. Actually, we just simply decompose the beta in another way, since beta = cov(l,m)/sigma_m² = corr(l,m)*sigma_l/sigma_m, where l, m are mv portfolio and market portfolio respectively, then corr is always smaller or equal to one, and sigma_l must be smaller than sigma_m, since mv portfolio has minimum sigma among all. Hope it is right.